The pressures for authentication of internet users are growing and many are legitimate. New methods to accomplish that are being explored but it is not yet clear which ones will prevail in the marketplace. The law and new regulations will give people some privacy protections even though they are required to disclose more. There will be a reasonable logic to sorting out what can be done anonymously and what requires authentication online. “Pseudonymity” will be available to people. Confidentiality and autonomy will be preserved and strengthened by then. With some extra work, though, users will still be able to move around online without being known. There are still good reasons for people to want to be anonymous online. 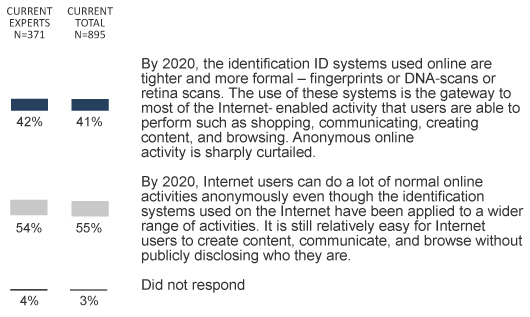 There are still sufficient “workarounds” that will allow people some measure of anonymity. The “semantic web” will help. The rise of social media and all the personal disclosures that go along with online contributions are as much a challenge to anonymity as particular authentication requirements. New online amateur forensics trackers can hunt down people with relative ease. There will also be reasons people will want to disclose information about themselves in order to manage their reputations. A culture of “information responsibility” will emerge. Users are not really tuned in to debates about privacy and anonymity and their indifference will allow others to set the policies. Challenges to privacy come from different directions in different places. In democracies and advanced industrial nations, businesses demand to know who you are. In authoritarian regimes, the government wants to know. Final thought: The online world mirrors the offline world – and always will.